Among all the so-called fusion foods served at chic Bangkok cafés, pasta topped with hoy lai pad nam prik pao¹ (หอยลายผัดน้ำพริกเผา) ranks pretty high on the popularity scale. While some fusion dishes appear forced and dubious, perhaps deserving the ridicule from food purists, some are actually good eats. This one certainly is, if one can get over the mental hang-up of serving something with a decidedly Thai flavor over Italian pasta. Serving a Thai stir-fry over pasta? For some, this isn’t even an issue. For others, this may signify a decay of the Thai cuisine as we know it, the beginning of a food evolution which, unless vigorously mitigated, could snowball into something one dare not imagine. At the very least, this could be a sin serious enough to warrant the appearance of a very scary dinner guest. I have something to say about that when I get back from my trip. The tenets of Thai cuisine are to be preserved, if we want to maintain the uniqueness. At the same time, the making of ultra-traditional Thai dishes with an imported, foreign ingredient is something that has been done for ages (this is well documented). Those who prefer complete freedom over what they eat may feel tempted to ask those who look upon fusion² with derision in a blanket manner to get off their lofty equestrian monument and chill out. I’ll let you decide which camp you belong. My role here is more to report what is made and consumed on a regular basis, and this is made and consumed on a regular basis by many. If you’re interested in making this dish, just make a recipe of stir-fried clams with Thai chili jam and basil and serve that over pasta. Easy. Done in a flash. 2 I don’t even know if this word means the same thing to all people. Well I did Korean Boolgogi aka Fire Meat – stir fried beef this week and tossed in Thai Basil. So there you go. This sounds incredible! 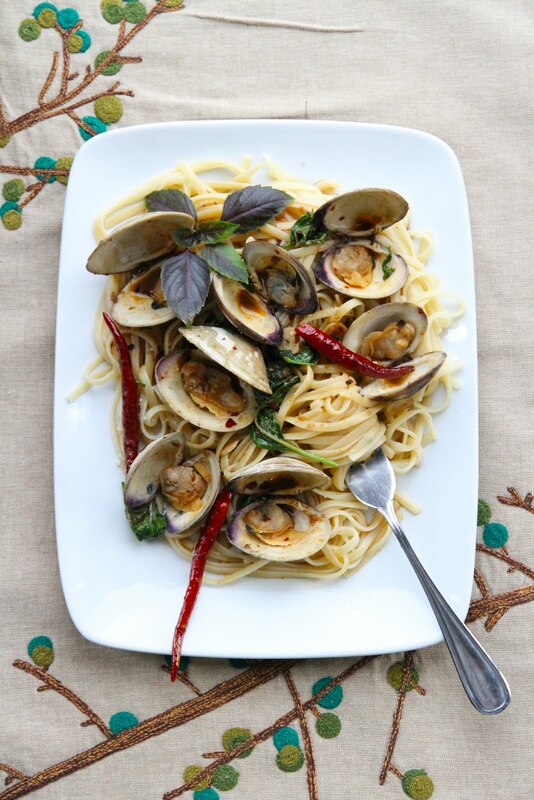 I adore clams, and Thai foods — I think I need to eat this immediately! Thank you! Nam Prik is my new favorite discovery — just the right balance of sweet, salty, spicy… Next time I’m going to make a larger batch. Instead of clams, I substituted squid and shrimp. Very tasty! I’m willing to believe in nam prik pao on anything. Best discovery I ever made on your site! I’ve gone through JARS since reading it–and that was less than a year ago…. i made it!!!!!! TWICE!!! super good! no chance for photo coz i was too hungry!!! tks for another yummy recipe.